Chasoif: The Prayer of the Lights. The painting Yoel Judowitz created in this video was inspired by a famous historical photo taken by a Jewish woman in 1930’s in her home in Germany. Across the street was the Nazi headquarters. She took the photo because she believed the Jewish symbol of light would outlast the Nazi symbol of darkness. Rachel Posner snaps a photograph of her family’s menorah set up on a windowsill. In the background, directly opposite the menorah, is a building draped with a Nazi flag. We needed to see what it looked like that night, after it was lit. We needed to see the power of light against ultimate darkness. To hear the music of that faith. Thank you Avigail Eisenstadt for the beautiful piano outro. 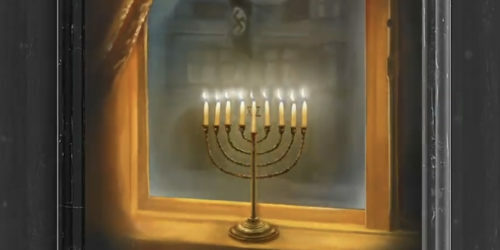 There are 2 Comments to "VIDEO: New Chanukah Song Composed by Yoel Judowitz; Inspired by famous Menorah picture in Nazi Germany"